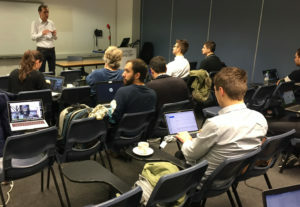 From January 28th to the 30th the COLA Code Camp took place in London and was hosted by Dr. Tamas Kiss, Project Director of COLA, at the University. The main goal of the meeting was to align the services of MiCADOscale (former “MiCADO”) with the gathered feedback of customers of the BETA test. The Infrastructure as Code approach enables MiCADOscale to set-up, manage and monitor applications as well as the scaling of related instances or containers.of Westminster. The event was opened by a welcome speech from Dr. Tamas Kiss providing an overview of the current status of the project’s work packages and the overall accomplishments already achieved. Following that, partners from all use-case and application teams gave presentations about current status of the use-cases and an outlook to upcoming tasks. The more than 20 partners attending the gathering achieved a comprehensive follow-up on the technical planning and integration and in preparing the next releases of Project COLA’s cloud computing orchestration software MiCADOscale.